The United Nations General Assembly declared 2011 as the International Year of Forests to raise awareness on sustainable management, conservation and sustainable development of all types of forests. Click here to find events being organized, and web tools and resources. Our newsprint comes from legal, certified, Canadian sources. Canada is a responsible source of wood, pulp and paper products that meet the highest environmental credentials. Canada’s tough forest regulations ensure that harvested areas are regenerated. In an effort to protect the boreal forests of Canada, the Canadian forest industry (21 members of the Forest Product Association of Canada [FPAC]) and nine Environmental Groups (ENGOs) signed the world’s largest conservation agreement on May 18, 2010. This agreement protects more than 72 million hectares of public forests licensed to FPAC members, from the provinces of British Columbia to Newfoundland. DID YOU KNOW? Wood is the most abundant renewable material on earth. Paper is renewable, recyclable, biodegradable and sustainable. Trees remove or sequester carbon dioxide from the atmosphere during photosynthesis and return oxygen back to the atmosphere. Carbon dioxide remains in the tree, even after it has been harvested. It is released only if the tree or wood or paper product produced from that tree burns or decomposes. When trees are harvested worldwide, their wood is used mostly for heating and cooking, and to produce close to 5,000 products, including homes and furniture. Canada still has 90% of its original forest cover (CCFM 2006b, WRI 2007); land for roads, agriculture, urban development and other non-forestry purposes makes up the remaining 10%. Since 1990, Canada’s rate of deforestation is virtually zero (NRCan 2008a). More than 600 million seedlings are planted annually to help forests regenerate. 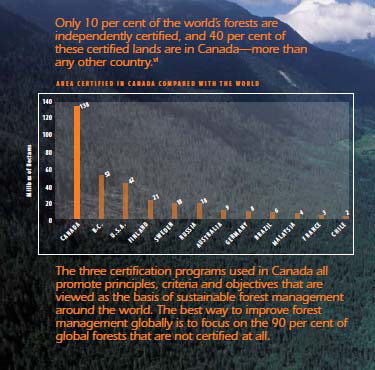 Canada has the largest area of certified forest in the world – about 150 million hectares, double the size of Alberta (see following page). Sawmill residues and recycled paper now provide 87% of the fibre used to make new paper and paperboard. Sawmill residue that is not suitable for making paper is used as biomass energy. Canada’s pulp and paper firms have raised their production levels by 8% while reducing absolute greenhouse emissions by 57% below 1990 – 10 times Kyoto targets. For more information, click here. Sawdust, shavings and other residues, like bark, become composite products and bio-energy. Bio-energy is an abundant, clean & carbon-neutral energy source. It is widely used by the forest products industry to power its mills and processes and contributes to its low carbon footprint. Our newsprint suppliers are subject to rigorous, independent, third-party scrutiny and verification of their sustainable forest management practices. In most cases, Canadian newspapers’ procurement policies require sourcing from certified suppliers. Forest management certification is a voluntary tool available to forestry organizations who want to demonstrate corporate responsibility by having their forest management planning and practices independently certified against a sustainable forest management standard. These standards set high thresholds that forest companies must clear – above and beyond Canada’s tough regulatory requirements. Consumers can consider certification as a factor in their buying decisions. Certification can help companies demonstrate that they are responsible forest managers. The public can value certification for its role in improving forest practices around the world. STATUS IN CANADA – 149,838,198 HECTARES!